As the summer season heats up, you’re probably planning trips to the beach, backyard barbeques and playground play dates. But the sunshine brings rising temperatures too — leaving you wondering if it’s ever too hot for your baby to be outside. The good news is there is no specific temperature that’s too high for a baby to go outdoors, according to experts at the American Academy of Pediatrics (AAP). What is important is to limit the amount of time your kids spend outside during the hottest hours and gear up with the right protection to safely enjoy the summer sunshine. Here are a few key tips to safely head outside with your LO when it’s hot. When planning daytime activities, the AAP says to limit sun exposure as much as possible between the hours of 10 a.m. and 4 p.m., when the sun is strongest. That rule is especially important for infants, who are less able to sweat (your body’s natural way of keeping your internal temperature down). Since that’s a large portion of the day, look for shade if you’re out and about during those hours to keep cool and protected from damaging rays. If your baby isn’t used to hot weather, take “baby steps” when introducing her to the outdoors (it can take up to 14 days for little ones to acclimate to hotter temperatures). Start by gradually increasing outdoor time over a 10- to 14-day period, taking breaks every 15 to 30 minutes during extreme weather. Experts recommend using caution in temperatures above 90 F (or 84 F with 70 percent humidity). Be extra careful about bringing baby outside in temperatures above 100 F, which can be potentially hazardous to little bodies. If you’re still unsure about your baby’s safety in the heat, tune into your mom intuition. If you feel too hot, sweaty or uncomfortable, chances are your baby does too … and a little air conditioning may be in order. But if you feel comfortable outside, it’s likely your baby is too — particularly since babies aren’t very active. If you’re using a stroller or car seat, consider one with a large canopy that provides extra sun protection for delicate skin. Canopy extenders can also help keep your baby shaded from head to toe. 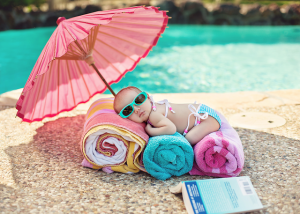 Avoid draping a blanket over your stroller or car seat for sun protection — even those made with breathable fabrics — as they can pose suffocation risks, increase the chance of baby overheating from poor air circulation, and prevent you from seeing your baby if she’s in distress. 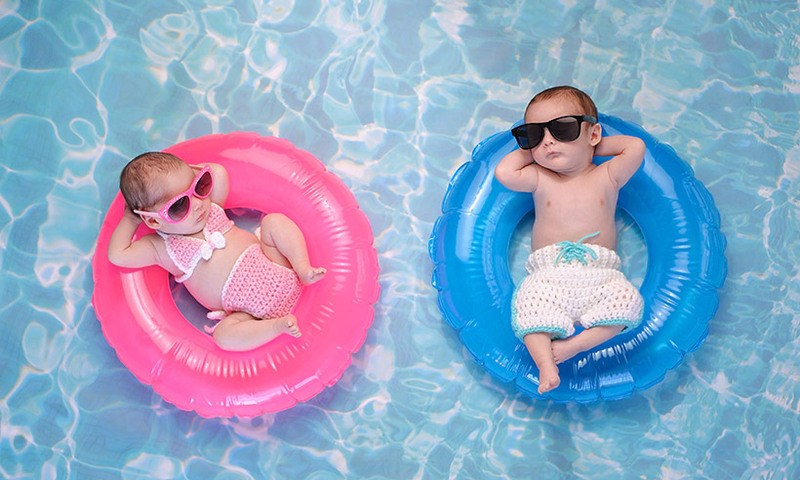 On very hot days, avoid overdressing your baby and leave that extra layer or light blanket in the car. A light-colored, short-sleeved onesie for young babies may be the best outfit, as long as you can keep your baby out of the direct sun. To give your baby’s face and neck extra protection, dress her in a brimmed hat. This is particularly important for little ones with little or no hair. If you can’t avoid direct sun exposure and your child is younger than 6 months, dress her in lightweight long pants and a light long-sleeved shirt. For children older than 6 months, lightweight shorts and a shirt in a breathable fabric like cotton are best. Look for clothing with a tight weave (not see-through) for maximum UV protection. Use chemical-free products containing zinc oxide and titanium dioxide. These mineral ingredients sit on top of the skin rather than being absorbed into it, making them easier on sensitive skin. Apply 30 minutes before sun exposure, and reapply often.For the best protection, cover any exposed skin with SPF 30 before you head outside, and reapply every two hours. Even during overcast days, the sun is stronger than it appears. Take special care around baby’s eyes. Have a squirming baby on your hands? Wait to apply sunscreen until she’s calmer or have your partner distract her with a toy. 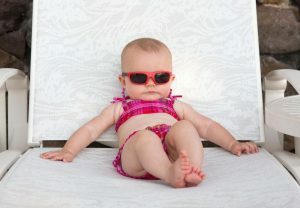 If your baby rubs sunscreen into her eyes, gently wipe both her eyes and hands with a cool damp cloth. Since your baby can’t tell you if she’s feeling uncomfortable, it’s important to keep on the lookout for cues of heat exhaustion or other heat-related conditions. Warning signs include being very warm to the touch (more than how your baby’s typically warm belly feels), extreme thirst, sweating profusely, acting very tired or weak and showing a general lack of energy. Since your baby may just be tired because it’s nearing naptime or she had an exciting morning, your instinct will tell you if your baby seems more off than usual. If you think your baby is suffering from heat exhaustion, immediately take her to a cool place and undress her to help her body shed excess heat. Sponge her down with cool water (but not cold enough to cause shivering). Continue to give your older baby small sips of water, or your under-6-month-old infant breast milk or formula. Call the pediatrician right away if symptoms worsen or seem severe. Just as you carry around your trusty water bottle on hot summer days, have fluid readily available for your baby. Infants under 6 months who aren’t drinking water should regularly drink breast milk or formula, but no need to overdo it. If you live in a particularly hot climate and think your infant might need more liquids, talk to your doctor about whether you should offer an oral rehydration solution (like Pedialyte) to replenish lost vitamins. Older babies can have small sips of water in addition to a normal bottle. It’s a good idea to call your doctor if your child is displaying signs of dehydration so he or she can do a thorough checkup and offer appropriate rehydration. If your baby is displaying severe symptoms of dehydration (a sunken soft spot on her head is a big red flag) or other symptoms worsen, see the doctor immediately. While an air-conditioned car is a great escape from the heat, it’s crucial to never leave a baby in a car, even for a quick dash inside the grocery store. In moderate sun, a car can become like an oven, rising 20 degrees or more in 10 minutes — extremely dangerous for little ones whose body temperature rises up five times faster than yours. Even in 60-degree weather, a car can heat up to over 110 degrees. Over 30 percent of deaths from overheating in a car since 1998 have involved children younger than 1 year old; in 2013 alone, 44 American children died of heatstroke after being left in cars. Bottom line: Keep your baby with you at all times. Choose the best onesie – here’s how!